*How do I get my resume to stand out? *What can I do to increase my chances of scoring an interview? *Why am I not hearing back from anyone and what can I do about it? *What are hiring managers really looking for? Following the Q&A session, attendees will have the opportunity to present their resumes to our panel of experts for review! Receive on the spot feedback to make your resume even stronger. This is an event that you won’t want to miss! Derik is a Certified Staffing Professional and has been in the Recruiting Industry for 5+ years with experience in both the IT and Creative/Marketing fields. Currently at Portfolio Creative, he helps clients to identify the top talent from entry-level up to Senior Managing roles. He works on disciplines ranging from Graphic Designers and Copywriters to Marketing Directors/CMOs and anything in between. In addition to the standard recruiting duties, Derik also handles the full cycle of the hiring process including negotiations, on-boarding, HR questions, pay raises, etc. Kendell has over 5 years of experience with full cycle recruiting, including her current role as Recruitment Manager at Quantum Health. She works directly with hiring managers to clearly define staffing needs and sourcing strategies in addition to managing the candidate process. She has an additional 10+ years of experience in Creative Operations, helping to lead the creative department at GSW Worldwide which included responsibility for freelance and contract staffing. Kendell currently holds the Certified Staffing Professional designation with the American Staffing Association. 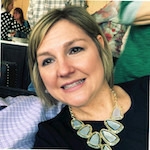 Lynn has extensive experience as a Corporate Recruiter for large brand companies, notably Southwest Airlines & currently as a VP Recruiter for JPMorgan Chase. She has worked in the commercial & private Aviation industry with responsibility for hiring cabin crew, pilots, support ground personnel & technology corporate HQ staff. In her current role, she works for the largest line of business for JPMorgan Chase, CCB in the Consumer bank, presently managing roles for Real Estate, Analytics, Project Managers, etc. Lynn is experienced with marketing/communications and digital hiring for the Marketing & Communications functions in addition to day to day, full cycle recruiting.